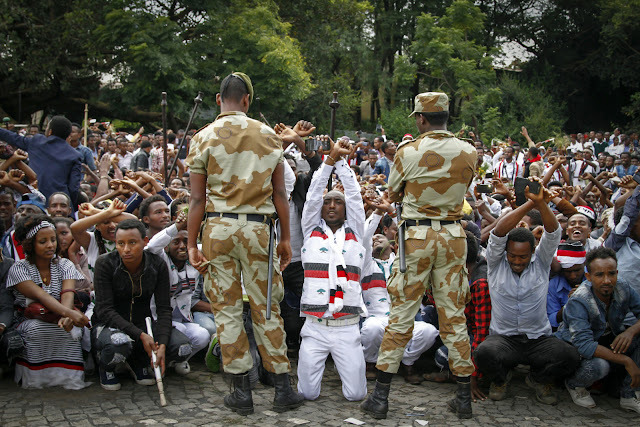 A state of emergency declared in Ethiopia last week is growing more draconian by the day. Posting updates on the current status of the country, hit by anti-government protests since last November, is now a crime, the government said over the weekend. Watching Oromia Media Network and Ethiopian Satellite Television and Radio, outlets run by the Ethiopian diaspora supportive of the protesters, is also illegal. “The military command will take action on those watching and posting on these social media outlets,” Siraj Fegessa, Ethiopia’s minister of defense, said on state television. Those who violate the terms of the state of emergency risk imprisonment of three to five years. Ethiopia’s largest ethnic groups, the Oromo and the Amhara, are protesting what they see as the marginalization of their rights and freedoms by the ruling Ethiopian People’s Revolutionary Democratic Front (EPRDF), dominated by the Tigray minority. After a week of intensified protests that left businesses and government property destroyed, prime minister Hailemariam Desalegn declared a state of emergency on Oct 9 for the next six months. No fewer than 500 people have been killed in the protests that began last year in response to a government plan to expand the capital Addis Ababa that would have encroached on Oromo land. Authorities have disputed this figure, a tally by human rights activists, but the prime minister last week admitted its accuracy. “When you add it up it could be more than 500,” Hailemariam said. Under the state of emergency, all expressions or communication that could incite violence have been banned, including the now famous protest gesture of raised hands, crossed at the wrist. Authorities can search and detain citizens without prior approval. Discussing issues with foreigners that could incite violence or communicating with groups deemed terrorists is also illegal. Listening to Voice of America or German Radio has also been banned. Diplomats have been barred from traveling more than 40km (25 miles) outside of the capital without prior approval. To protect businesses and government property, a 6pm curfew around major infrastructure projects, farms, government institutions, and factories has been put in place. In an attempt to appeal to protesters, the government has also announced plans to reform the election process to allow more representation of different ethnic groups in the government. The EPRDF hold all of the country’s national parliamentary seats.